The Upanishads are part of Vedanta or the last part of the Vedas, the oldest scriptures of Hinduism created between 1500–1000 BCE. The Upanishads contain revealed truth (Sruti) about Brahman (God), the Ultimate Reality and the way of salvation (Moksha). Term Upanishad derives from upa- ('nearby'), ni- ('at the proper place, down') and sad ('to sit') and it means 'sitting near a teacher to receive the sacred teachings'. Vedanta (anta 'the end' or 'last portion') is the essence and culmination of all the knowledge within the Vedas. Vedas (vid - 'to know', 'knowledge' of the eternal truth). The Upanishads deal the disciplines of philosophical knowledge (jnana), divine love (bhakti), action (karma), and yoga. They express the same truth as the Bhagavad Gita and the Brahma Sutras. Brahman (lit. brih - 'to grow, to expand' also 'the greatest') is God. 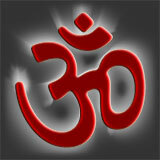 The sanskrit name for God is Sat-Chit-Ananda = Sat (Existence), Chit (Consciousness), Ananda (Bliss). Brahman is Sat-Chit-Ananda in many different forms and God the formless (Existance, Consciounsess and Bliss). Brahman is the Universal Spirit; the Ultimate Reality, Pure Consciousness; the One existence; the Absolute; "the unchanging reality amidst and beyond the world", which "cannot be exactly defined". The instructions regarding Brahman were often given in short formulas also known as Upanishads. The description of Brahman: "Not this, not this" (Neti, Neti); for there is no other and more appropriate description than this "Not this." Now the designation of Brahman: "The Truth of truth." The vital breath is truth and It (Brahman) is the Truth of that. According to Shankaracharya, the sole purpose of the Upanishads is to prove the reality of Brahman and the phenomenality or unreality of the universe of names and forms, and to establish the absolute oneness of the embodied soul and Brahman. Brahman and Atman, individual self. This Vedic truth is not a product of the human mind and cannot be comprehended by the unaided human intellect. Only a competent teacher, through direct experience, can reveal to the qualified student the true significance of the Vedas and the fullness of their absolutely consistent truth. The ultimate Brahman is devoid of attributes. The entire phenomenal universe is subject to the categories of space, time, and causation; but Brahman, the Supreme Reality, is beyond. In contrast with phenomenal objects, Brahman is not in space but is spaceless. Brahman is not in time but is timeless. Brahman is not subject to causality but independent of the causal chain. "That which is not destroyed when the upadhis of time, space, and causation are destroyed, is Brahman, the immortal Reality." In describing Brahman as omnipresent, all-pervading, unlimited, infinitely great and infinitely small, the Upanishads only point out that It is absolutely spaceless. Brahman is the essence of the eye (' the Eye of the eye', 'the Ear of the ear') the mind etc. Brahman — Eternal, Infinite, Unconditioned — cannot be made an object of material, limited and finite senses. The speech cannot define Brahman. Fire, which burns and illumines other objects, cannot burn or illumine itself. For example the Upanishads tend to describe qualified Brahman as masculine 'He' and Para Brahman as 'It'. The Vedas cannot show you Brahman, you are That already; they can only help to take away the veil that hides the truth from our eyes. in other words, identify yourself with Atman, not with human limitations. Dis-identify yourself with the body, and all pain will cease. This is the secret of healing. The universe is a case of hypnotisation; de-hypnotise yourself and cease to suffer. In order to be free we have to pass through vice to virtue, and then get rid of both. "The Self (the Soul) is Brahman." the wise call It by various names. All true religions describe the same God but just different paths to find him. The Vedanta often describes Brahman as Sat-Chit-Ananda. Sat (Existence, Reality, Being), Chit (Consciousness, or Knowledge), and Ananda (Bliss). Existence, Consciousness and Bliss are not attributes of Brahman but Brahman Itself. "In the beginning, my dear, this [universe] was Being (Sat) alone, one only without a second." "All this that we see in the world is Brahman." "Brahman is Reality, Knowledge, and Infinity." The core of Yajnavalkya's teachings in the Brihadaranyaka Upanishad is that Brahman, or Atman, is the knowing subject within us. —the Self that is within all." The image of an object is carried to the brain by a sense-organ, for instance the eye. After passing through various sheaths (kosas), it reaches at last, according to the Hindu psychologists, the sheath of the intellect. There the light of Brahman, or the Self, which is reflected in the intellect, illumines the mental state regarding the object, and thus one becomes aware of it. The mental image of the object is transformed into knowledge of the object. But this mental state is impermanent; therefore the consciousness—which in reality is Brahman— associated with the mental state appears to be impermanent. There is no bliss in anything finite. Only the Infinite is bliss. — only the one infinite Brahman exists. According to the Vedanta, when a man has arrived at that perception, he has become free, and he is the only man who is fit to live in this world. Others are not. The worst punishment according to the Vedas is coming back to earth, having another chance in this world. the living, conscious human body, and to worship at this altar is far higher than the worship of any dead symbols. Atman alone, one and without a second, exists both before the creation and during the states of preservation and dissolution. Names and forms, which distinguish the phenomenal universe from the state before the creation, are superimposed upon Atman through maya. The word, derived from the root ap, ad, or at, may mean respectively, to obtain or pervade, to eat or enjoy, or to move without ceasing. The term Atman indicates the "Supreme Reality, omniscient, all-powerful, free from all phenomenal characteristics such as hunger and thirst, eternal, pure, illumined, free, unborn, undecaying, deathless, immortal, fearless, and non-dual." Life is unstable as the water on the lotus leaf. Therefore if you have enthusiasm for acquiring this knowledge of Atman, do not wait any more but come forward immediately.